I recently went on a cross-region Japan trip with my two best friends, and had the time of my life exploring new cities. But what would a Japan trip be without invading my fave beauty stores? We’ve previously mapped where we get our beauty fix in Tokyo in the first version of this article, but there’s still so much to see! This guide lists more stores that you’re sure to find in most cities - be it all the way in Sapporo, or all the way down in Fukuoka. Japanese brand Lululun has new sheet masks - here's what we think! DHC Deep Cleansing Oil: Is this better than the Shu Uemura one? This is a chain store carrying a diverse range of seasonal gifts, stationery, and of course, beauty products. Apart from stocking up on J-Beauty, you can pick out kawaii stickers and other interesting omiyage (pasalubong). Though they’re not a primarily a cosmetics store, you can find a lot of the top-ranking Japanese beauty products here. Check out Opera lippies for the glossy pout that the Japanese favor, and grab a long-wearing liquid brush-tip eyeliner from Flowfushi. If you wanna take home hair care, Loft also has a selection of cute brands. I can easily spend half a day in Tokyu Hands! This is a multi-level chain store where you can find an excellent curation of brands and products in different categories from Japan and abroad. Go crazy for Campus notebooks in their stationery floor, or shop for an Anello bag (they’re cheaper to buy in Japan). Unlike Matsukiyo (Matsumoto Kiyoshi), Loft, and Donkii (Don Quixote), shopping in Tokyu Hands doesn’t feel as overwhelming and hectic because their layout is spacious and neatly arranged according to brand or product. IMHO they also have one of the better curated collections of affordable to mid-range brands. Den had me buy her favorite Canmake Mermaid UV Gel, and I found some “natural beauty” Japanese brands that I had never heard of before. They have beauty gadgets for the hair and skin, too. This is the Cosme Store in Taipei since the one I went to in Ikebukuro was under construction. Cosme is a popular Japanese rating site where users rate the best products in different beauty categories. This store is a little harder to find (I’ve so far only spotted them in Dotonbouri in Osaka and in Shibuya in Tokyo). If you want to shop for new discoveries or just feel overwhelmed (a common reaction to being faced with sooo many options), check out their top ranking products to see what people usually rave about! Aside from travel and beauty, I go weak in the knees for cute earrings. I actually went into ITS’DEMO for the accessories, and was surprised to find that they also have a decent beauty selection. They have mostly Japanese brands like Ettusais, Canmake, and Opera but there was also a small selection of Korean makeup like The Saem Tip Concealer. I usually spot ITS’DEMO in train stations connecting to malls or underground malls like the stores in Bangkok, with a unique fashion convenience store concept. 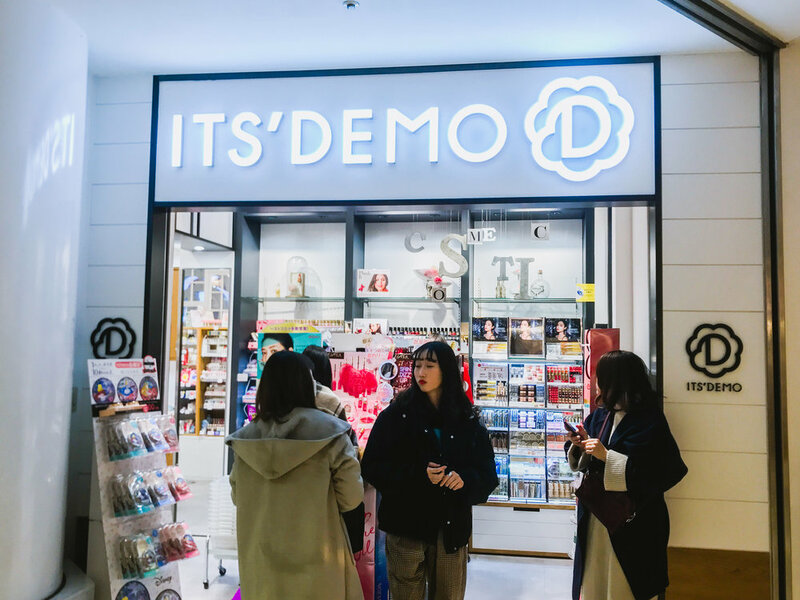 Fun fact: The store name is a play on “itsudemo” which means “whenever” in Japanese! These one stop-shops have some of the cheapest prices and are the most foreigner-friendly - they have dedicated staff who speak Chinese, English, or Korean! Available brands will vary from store to store, but you will certainly find the bestselling brands like Suisai and DHC here. They also sell gadgets like hair dryers and facial steamers, but I would discourage from buying those because, despite the good prices, Japanese electronics use a different voltage. Whenever I’m in Japan, I find myself frequenting their konbini (convenience stores) a lot for the candy, ice cream, Chuhai, and tuna mayo onigiri. But like in our local convenience store beauty challenge, you can get beauty products here in a pinch! You can find a travel-sized version of the DHC Cleanser, and a selection of makeup from brands like Integrate by Shiseido. Want to avail of tax-free shopping? You can if your products reach to ¥5000 (excluding tax) and above! Most stores will have a Tax-Free sign on their storefronts and at the cashier so just keep an eye out for it. They will look cool and you’ll be tempted by the prices, but I’d really caution against buying beauty gadgets from Japan because of the voltage difference. They use a lower voltage of 100V, while our standard voltage is 220V. While cash is still king in most Japanese establishments like konbini and restos, you can use your credit card or even your IC card like Suica or Pasmo while shopping at most stores. Where do you shop for beauty products in Japan? Any places we missed out? We’d love to know what your favorite Japanese beauty finds are!